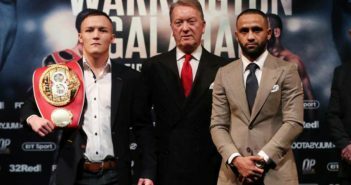 IBF World Featherweight Championship between World Champion Lee Selby and the IBF Mandatory Challenger Josh Warrington is taking place on May 19th. Leeds hero Warrington (26-0, 6 KO’s) brought the blockbuster all-British showdown closer to reality by stopping previously unbeaten Dane Dennis Ceylan in a Final Eliminator clash at the First Direct Arena back in October 2017. 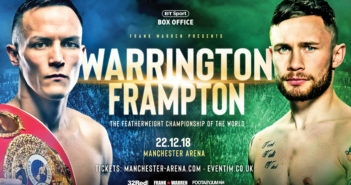 A former English, Commonwealth, British, EBU European and current WBC International Featherweight Champion, Warrington is now determined to join the Featherweight elite by becoming Leeds’ first ever World Champion. The Yorkshire warrior will be aiming to go one step further than Leeds native Crawford Ashley who challenged for the WBA Super-Middleweight and Light-Heavyweight World Titles in the 1990s. Welshman Selby (26-1, 9 KO’s) claimed the IBF Featherweight crown against Russia’s Evgeny Gradovich at the 02 Arena in May 2015 and has subsequently made four successful defences of the title, the most recent being against Eduardo Ramirez at the Copper Box Arena in December. The Barry stylist and Warrington have been embroiled in a long-running hateful social media spat, with Selby accusing the Yorkshireman of ‘bottling’ an opportunity to face him in 2016. But now the bitter rivals will settle their feud once and for all in the first ever World Title fight to be held in Leeds. Both men know there is potentially a greater prize on offer than the belt itself, with victory in May likely to provide a passport towards a summertime showdown with former two-weight World Champion and Frank Warren stablemate Carl Frampton MBE. “Let’s see what Josh is made of,” stated Selby on his mandatory date being set. “He’s done everything that has been asked of him so far. He’s picked up my vacated titles and beat a lot of my past opponents. To his credit, he’s earned his position as my Mandatory Challenger and deserves his shot. 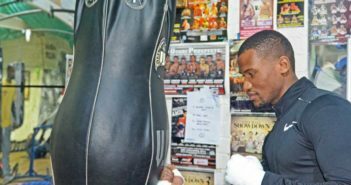 “If Josh comes steaming out like he has done in the past that will just play into my hands as I’ll pick him off like I have done with numerous past opponents. If he opts to box on the back foot I definitely can’t see him outboxing me. In fact, there’s no way I can see him beating me. As far as Warrington is concerned, the winner on the night will be sporting the colours of Leeds United as he represents his city on what he is sure will be a history-making occasion. “By winning this fight, not only do I get my hands on a World Title, but it’s a chance to show everyone that I’m the best featherweight in the UK and propel myself onto the World level,” insisted the 27-year-old. “For the past three or four years our names have always been mentioned together. He’s always been that one step ahead of me and everyone has always looked at him as the number one Featherweight in the UK, but that will change on May 19. “It’s going to be an entertaining fight for the fans but there’s only going to be one winner and that’s me. He’s not a perfect fighter or a polished fighter, he’s got a lot of weak points and I’m going to exploit them. Promoter Frank Warren added: “This is a fight that has all the ingredients of a classic. It’s the one that we have all been waiting for. There really is no love lost between these two and on May 19 they finally get to settle their feud. “This is a fan friendly fight and guaranteed to entertain those in attendance and watching at home. Whether the relentless volume punching of Josh can unhinge the stylish probing of Lee, we’ll have to wait and see. Josh has been working towards this fight his whole life and has the chance to achieve his boyhood dream in his home city. Tickets for the fight Selby vs Warrington will be well sought after as his many Leeds fans will want to be there to show Josh their support. The fight will also be shown live and exclusive on BT Sport and BoxNation.